What are you up to on the weekend of February 17 next month? The correct answer to that question is attending the PC Gamer Weekender in Olympia London; a PC gaming extravaganza where you’ll be able to preview the latest upcoming games for 2018, hear from your favourite developers at in-depth panels, and take part in workshops, tournaments, and the extra special Omen by HP Bootcamp. As if that wasn’t enough reasons to attend, the convention will include world premiere reveals for some of the most anticipated PC games on the horizon. For example, its just been announced that exclusive new gameplay for Two Point Hospital will be shown on-stage by the developers themselves, at a special panel taking place at 11am on February 17. 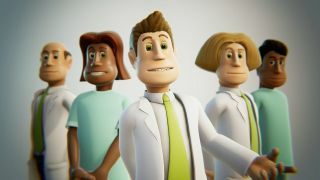 The panel will be looking back at the history of the Two Point Hospital series and its creators, while viewers may be treated to a look at a brand new illness featured in the upcoming business sim sequel. Speaking of panels, as well as Two Point, the PC Gamer Weekender is chock full of exciting sessions to check out. There’s the Project X panel at 12pm on February 17, which will lift the lid on the first gameplay footage for the 400 player Battle Royale game, or you could check out a live and on-stage walkthrough for Kingdom Come: Deliverance, hosted by Warhorse Studio’s very own Community and PR manager Tobias Stolz-Zwilling. Blades and bullets aren't your cup of tea? Why not schedule yourself into the Minecraft panel at 4pm on February 18? It’s led by Mojang’s lead creative designer Jens Bergensten, who will present an update on the studio’s plans for the game in 2018. Alternatively, Firaxis will be hosting a session called Tales from the Helm of Civilization VI: Rise and Fall, in which lead designer Anton Strenger and lead producer Andrew Frederiksen will offer a behind the scenes look at the upcoming expansion for Sid Meier’s impeccable strategy game. All in all, there’s a lot to be excited about in this year’s PC Gamer Weekender, and anyone who buys a ticket will receive four free games worth £29.99, so you really have no excuses left to miss this one out. To keep up with the latest updates and announcements about the show, make sure to follow @PCGWeekender on Twitter, and you can find out more and buy tickets on the official site. Add the code: GR20 at checkout to get 20% off the ticket price!